Jamie Madrox: how can you not love this character? I’m sure our reader Lukas likes him, since we are answering his request. 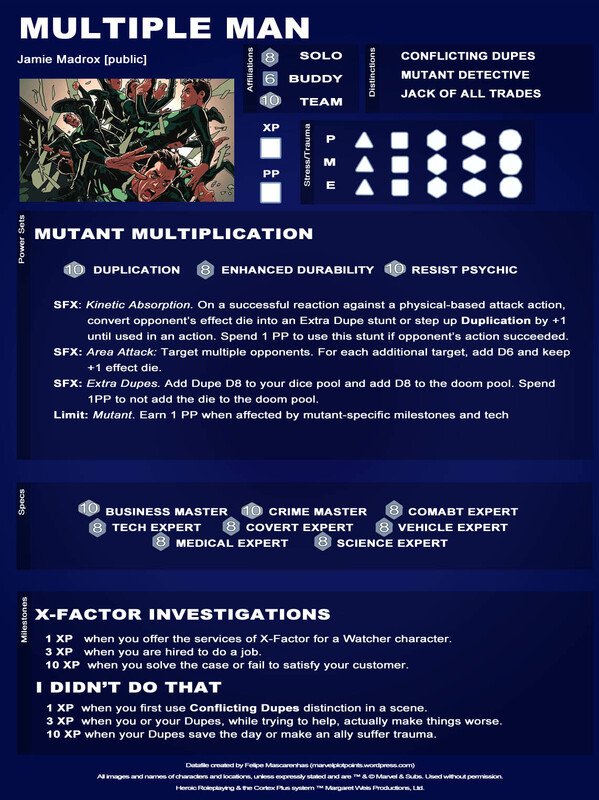 Multiple Man started as a C-list mutant that refused Xavier’s invite to join the X-Men and grew from that until he became the leader of X-Factor Investigations, a major player on the Mutant side of the Marvel Universe. Nowadays, with Peter David as writer, Madrox really shines and makes his mark on Marvel fandom. Design-wise, the main challenge was to emulate his Duplication power, because on the Basic Game there isn’t such power set. I had two ideas, the first was to make him able to create mobs, but since it would create the need for a whole subset of rules, I decided to go with the second idea, which was a more subtle and PP/SFX dependent approach. I just created the “Duplication” power, that essentially works like Super Strength, with the plus side of being able to be used on scenes where you may need a lot of coordinated people, like sailing a boat. All his SFX represent his ability to create dupes, taking advantage or contributing for the general mayhem of the scene. Also, he has almost all the Specialties in his file, to reflect the collected knowledge acquired by his dupes. In transition scenes, creating resources from specialties is as simple as summoning the right guy for the job. Nice. That looks like a good way of handling Duplication. Give him a “mob generating” power or sfx was kind of a obvious choice. But i thougth i would have to bend the rules a lot, and since he does not loose power when the dupes die or get knocked out, that’s why i chose the other way. But, if you need a version with a “mob mechanics” here is what I would do. SFX/Limit: Mob of Dupes: Shutdown Mutant Multiplication and take an action against the doom pool, add the effect die (dice) to your afilliation to the durantion of the scene. When you would suffer stress, remove afiliation dice instead. Thanks for doing this! I like your take; it’s pretty close to what I was imagining. Lukas, i’m glad you liked it. We would be more than happy to hear from you what you would have done differently. When making a roll that includes the CLONES die, you may use your TEAM affiliation die instead of your SOLO or BUDDY dice regardless of the number of other heroes in the scene. Add a d6 and keep an additional effect die for each additional target. Add a d6 and step up your effect die by +1 when using KINETIC DUPLICATION to create assets in the form of additional clones. When rolling you may split CLONES into 2d10 or 3d8. Earn 1 PP when affected by mutant-specific Milestones and tech. Change CLONES into a complication and gain 1 PP. Activate an opportunity or remove the complication to recover the power. NIce work Lukas! I realy like your approach. If you split up the group, though, can he continue to act with both groups since he has dupes in both locations? I wouldn’t allow him to have 2 actions, but, i would probably let him create assets and complications even when split. Maybe you could allow him to choose to act with either group on his turn. 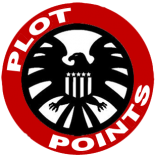 Consider posting your Fan-Made Datafiles on the MHRP Wiki! This entry was posted on April 24, 2012 by felipenerdcore in Datafiles.